Math Mammoth Grade 7 Pre-Algebra curriculum - description, samples, and purchase info. Math Mammoth Grade 7 Complete Curriculum is a complete pre-algebra program for 7th grade. It fully prepares students for an algebra 1 program. 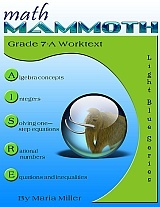 You can purchase Math Mammoth Grade 7 as a download, on a CD, or as already printed books. You can purchase a lesson plan for Math Mammoth Grade 7 to use it in Homeschool Planet online planner. Learn more. Math Mammoth Grade 7 is, in a sense, a hybrid program. It can be used as a traditional pre-algebra program or as a 7th grade math program that meets and exceeds the Common Core standards. When using it primarily for pre-algebra, you may omit the last chapter of the curriculum (statistics). Otherwise, you may omit the chapter on the Pythagorean Theorem. Please also see the table of contents 7-A and 7-B (in the sample files), which will let you see the topics covered in more detail. "...what a breath of fresh mathematic air. There is minimal prep required of me, and my daughter can move through the curriculum on her own with little instruction from me." For $9.95, you can purchase a lesson plan for Math Mammoth Grade 7 in order to use it in Homeschool Planet online planner. Learn more. The curriculum meets the Common Core Standards (CCS) for grade 7 but also exceeds them in several places. For example, we study linear equations in more depth than required in grade 7 CCS, and the curriculum includes the Pythagorean Theorem, which in the CCS is in grade 8. You can access a document detailing the alignment information at this link or in the download version of this curriculum. Chapter 9 covers square roots, the Pythagorean Theorem, and its applications. You may omit the entire chapter if necessary (such as for lack of time), since the Pythagorean Theorem is also included in any 8th grade math program that follows Common Core, and in high school math courses. 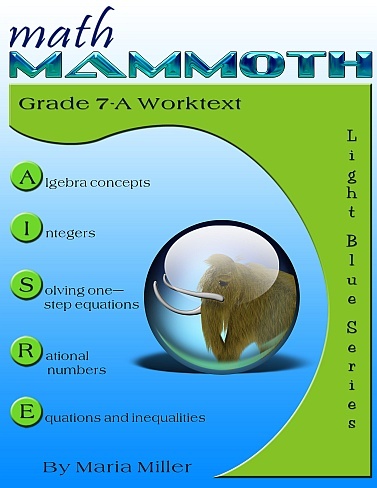 Math Mammoth Light Blue Series 7th grade Review — by Felicia Mollohan at Homeschool4Life blog. Review of Math Mammoth Prealgebra Curriculum by David Chandler from Math Without Borders. I just wanted to give you a quick not of appreciation. Thank you so much for your curriculum. I just covered 7th grade the distributive property. YES!!!! I love the way you introduced this and the way the problems build to understanding. My students were excited about solving these problems. It was like a fun puzzle for them. This is a big gem!!!! Hi Maria, I just wanted to express how happy I am with your math program. It has been a life saver. It is thorough, inexpensive, and not teacher intensive. Thank you so much for helping a homeschooler with your wonderful program at such a reasonable price.